HomeNews & InsightPre-engineered Metal or Conventional Steel? 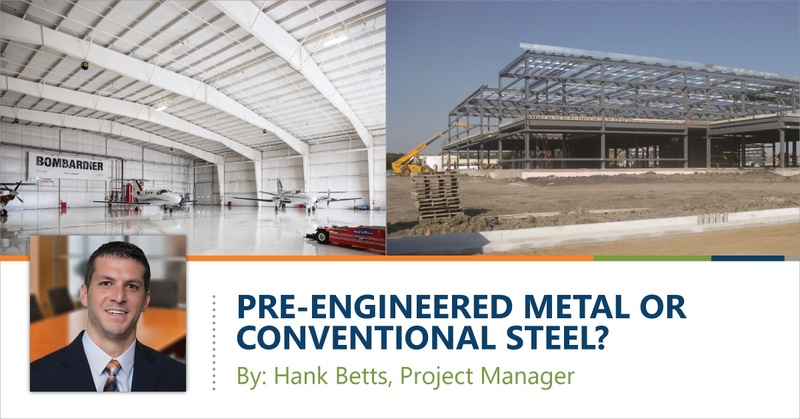 Pre-engineered Metal or Conventional Steel? The question tends to prompt strong opinions about both methods. But the correct answer is, it depends. 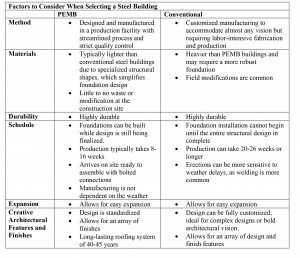 Both PEMBs and conventional steel offer specific advantages, depending on the owner’s budget, needs, and desires. Well-constructed PEMBs offer a highly durable, schedule-friendly solution at a competitive price. PEMBs are designed and fabricated in a manufacturing facility, which protects against weather or seasonal delays. In addition, PEMBs are manufactured with specialized structural shapes. This limits the amount of steel used and the weight of the building, which holds down costs. When it comes to timing, PEMBs offer a tremendous advantage. The design software allows for the foundations to be engineered early in the process. As a result, the permitting application can begin sooner, and the foundations can be installed while the design is being finalized. The building system can be delivered as soon as the foundations are completed, effectively cutting months from the project schedule. In fact, buildings typically arrive in 8-16 weeks; simple buildings can even qualify for a turnaround of six weeks. In addition, PEMBs require minimal field fabrication. They can also be manufactured with mostly bolted connections, which expedites the erection process. As a result, owners can get operations up and running much earlier than is possible with a conventional steel building. On the downside, PEMBs are less conducive to bold architectural design than a conventional steel building. However, the versatility of wall systems and structural finishes provide for unique and personalized aesthetics. One of the primary benefits of conventional steel is that it allows for complete customization. This is essential for buildings that require unique structures or that serve multiple or abnormal needs. Conventional steel is also a good fit for structures that are more than two stories in height. In addition, conventional steel is more accepting of reinforcement, which makes it easier to change dead loads. This provides more flexibility for changing process equipment lines, rearranging production floor plans, adding rooftop HVAC equipment, modifying sprinkler or plumbing lines, adding cranes to a structure, and so on. Conversely, conventional steel is typically more expensive. The structures are made from rolled T-sections of steel that consist of more material than PEMB structural members. This adds weight to the structure, which requires more robust concrete foundations. These factors add more cost to the budget and more time to the schedule. Conventional steel lead times run in the ballpark of 20-26 weeks, as material is usually sourced from multiple vendors and requires significant in-house fabrication prior to reaching the job site. Siding, roofing, trim, and accessories are usually purchased from a separate vendor, adding another layer of accountability and coordination. The good news is that owners are not limited in their choice. A hybrid design can bring together the best of both methods to satisfy the owner’s vision—and budget. The key is to work with a design/build team that understands the advantages and drawbacks of both methods and can offer informed guidance. 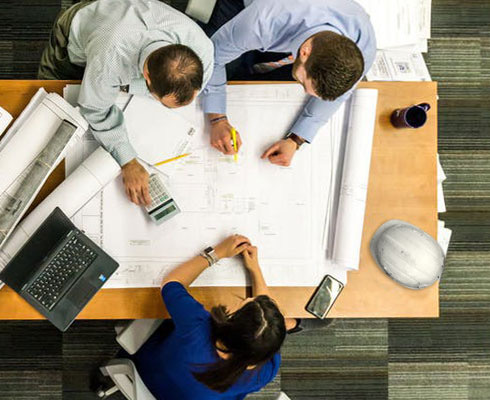 Engaging the team early is also essential for ensuring that all necessary factors are considered prior to design. For example, load weights are critical to any design, but more so for PEMBs. That’s because PEMBs are less forgiving than conventional steel when it comes to reinforcing the structure. Adjusting the floor plan and moving equipment after a project is designed can dramatically drive up costs if dead loads shift. Working with a team that knows what questions to ask on the front end will help prevent redesign charges later in the project. Insurance is another, often hidden factor, that can drive design decisions. Owners need to work with a partner who can protect against building decisions that could raise rates. And finally, it’s never too soon to think about the future. A design/build partner should help define the owner’s needs both now and down the road. If additional changes are forecast in the next 10-15 years, the design should anticipate growth. This will save both time and costs when the time to expand arrives. At Miller-Valentine Group, we do not adopt a one-size-fits-all approach to steel structures. We listen to our clients’ needs before making a recommendation. And when a PEMB is truly the best, most cost-effective solution, we rely on our partnership with Butler Building Systems to deliver a high-quality, durable product. One of the many benefits to this partnership is the ability to also provide a conventional steel solution if a PEMB is not the best fit or if a hybrid solution is warranted. We have long-standing relationships with some of the best engineers and fabricators in our local markets to provide additional options when conventional steel makes the most sense. For more information on determining which building method will best serve your needs, contact Hank Betts at 937-528-4007.